With homemade pizza, you can mix all your favorite ingredients and toppings. 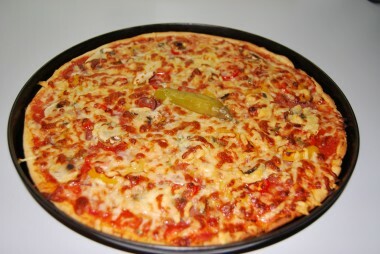 Homemade pizzas open up a wide field for creating the desired taste. You can mix all your favorite ingredients. Also you can design your special pizza sauce e.g. with Cuban Oregano for an extra ordinary flavor. In a medium bowl, add yeast and lukewarm water and stir well until the yeast is dissolved. Let it rest for 5 minutes. Shift the flour in the bowl and add salt, sugar/honey and olive oil. Mix well until all ingredients come together. Put the dough on your table and knead it well for 3-4 minutes to get a smooth dough. Use a little more flour if the dough is too sticky, or a little bit of water, if it is too steady. Grease the dough a little bit and put it back in the bowl. Wrap the bowl with plastic foil and let the dough rise on a warm place for about 30 minutes or until it has doubled in volume. Flour the table surface and roll out the dough with the dough roller (if not available, use a clean glass bottle) until you get the size of the pan. Place the dough in the well greased pan. Spread the tomato sauce on the dough and cover it with your favourite pizza ingredients. Finally sprinkle 2 cups grated mozzarella cheese over the top. Bake the pizza at 425 °F for about 17 – 20 minutes, or until the dough edges are lightly golden brown. If possible, rotate the baking sheet after 10 minutes baking time by 180 degrees for more even baking. Serve with fresh garden salad and an Italian dressing .